This event has passed (July 8 2017). 3 courses, each paired with a tequila and a mini brunch cocktail Tequila dinners are all well and good, but we know brunch is your favorite meal of the day! 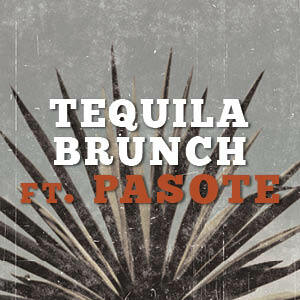 Join us for a fun, three-course brunch, paired with a flight of Pasote Tequilas, and enjoy those same tequilas in twists on your favorite brunch cocktails. About the tequila Pasote is a new family of tequilas from master distiller Felipe Camarena, a third-generation distiller in a family of tequila makers. Camarena, originally trained as a civil engineer, worked most of his life in his family’s distillery before building his own in 2007, called El Pandillo. Many consider Camarena to be a mad-scientist-type distiller, and he is very passionate about making as perfect a tequila s he can. While using traditional methods of tequila distillation, Camarena also brings an innovative spirit to tequila and has designed and built many of his own tools and equipment for use in his distillery, including a mechanical tahona for crushing the agave and a modified steam oven or horno that cooks the agave more evenly. One of Camarena’s most interesting innovations is the collection of rainwater for use in distillation. As most tequila is distilled to a higher proof and then diluted with water to around 40% ABV, the water plays a large part in the final flavors and aromas of the tequila. Pasote is made with 60% spring water and 40% rainwater, which adds a unique mineral note and fresh quality to the spirits. Pasote is also very agave-forward, with oak aging playing a supportive role to the sweet and vegetal flavors of roasted agave.